Blackjack, also called ‘21’, is certainly the most popular casino game next to roulette. Blackjack has always attracted mathematicians and gamblers because it was, or still is, actually possible to beat the house. In the 1960’s the US mathematician Edward O. Thorp published a ground-breaking book entitled ‘Beat the Dealer ’, which ultimately earned him the nickname of ‘the father of card counting’. In his book he revealed a revolutionary point scoring system that has since been successfully used by professional and amateur card players for more than two generations. Counting systems have since been further developed and there is now a plethora of more or less similar techniques, some more complex than others, but in the end all giving the gambler an advantage over the house. Card Counting is actually pretty simple maths. The only real skill necessary is to be able to add-up and count in your head like a machine gun. Not everyone can do it, but it goes without saying that the less effort you need to make on the counting, the more concentrated you can become on appearing as just another ‘normal’ player at the table. One of the most profitable and perhaps the easiest way to count cards is known as the Hi-Lo strategy (allocating high and low cards in the game a value). This system is basically a ‘Running Count’ technique in which each card has a certain value. The system is used to identify when the ratio of cards already played with high value is unbalanced compared to cards with low value. Cards such as Tens, Picture Cards and Aces, not only increase the chance that a Blackjack is due, but also increase the chance of future hands which are worth at least 20. A deck which includes many high cards brings the player into a very profitable situation, because it increases the chance that the dealer loses. In a situation where the majority of cards left in the shoe have a value between 2 and 6, the dealer has a significant advantage over the player. The more high cards left in the deck to be played, the higher the chance that the dealer loses. From the moment the first card of a new mixed deck is dealt, the player begins to count the card values (+1, 0, -1). 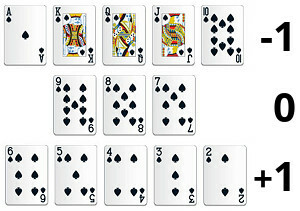 A low card (2, 3, 4, 5, 6) increases the count by one point, a high card (10, J, Q, K, A) decreases the count by one point. This is called the ‘running count’. The cards 7-9 are neutral and are not counted in the Hi-Lo system. Count the total number for this round, and you should come up with +1. This count means that more cards with a low value have already been played, meaning there are more high value cards in the remaining deck (10, J, Q, K, A). However, you need to keep in mind that the count cannot be very accurate after just a few hands. It is important to collect more information for better accuracy and greater advantage over the house. If you are trying Blackjack card counting for the first time, you can just flip through a whole set of cards. If you count correctly then you will end up with a ‘0’ at the end of this exercise. The first few times may be trial and error, but the more you practice, the faster and more accurate you will become. After a while you can try to count two cards at once, just by looking at the hands. If you practice long enough then you will almost automatically recognize various card combinations and their value. And that’s the great thing about this simple Hi-Lo strategy. It’s very straightforward and easy. It will not be long before you can apply this simple technique and at the same time play blackjack at normal speed. You need to keep the current value in mind and at the same time focus on the game without drawing attention to yourself. If you have not yet mastered the counting system by heart and need to think long until you get to the current value, then you will stand out to the dealers and security staff because they are trained to detect counting behaviour. After you have mastered the counting itself, the next step is to know when it’s worthwhile to start staking and how much to bet. As already mentioned, the rule of thumb is that the closer the table is to the end of the deck, the more predictable the outcome. Here, a new factor comes into play known as ‘True Count’. 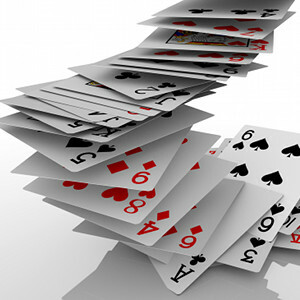 Divide the running count by the estimated number of remaining decks in the card shoe. This is the part that beginners get confused with. The running count is +7 and there are about 4 decks left. The true count would be 7/4 = 1.75. Round that up to 2, keep it simple. Converting the Running Count into the True Count is about getting a more accurate estimation of whether or not you have an advantage. These days you won’t find many single deck games, so it’s likely that you will be playing on a multiple deck table. These can range from two to eight decks so you will have to estimate the number of remaining decks. One way of determining how many cards have already been dealt is to look at the discard tray on the table (if there is one). Practice estimating at home by piling decks of cards on top of each other. Once you have estimated how many decks have been played you then need to subtract this number from the number of decks the game started with. This is the number of decks remaining. Here is an example for a six deck game. You have a running count of 12. You look at the discard tray and see that approximately three decks have been played meaning that there must be still three decks remaining. You divide the running count of 12 by 3 to get a true count of 4. The greater the True Count, the more you can bet. This is where card counting becomes more art than science. Some blackjack books give rigid rules on how this should be done. However, casino employees are also aware of the published techniques and certain betting patterns can easily betray a card counter. The key to making money as a card counter is raising your bets when the deck is ‘hot’, and lowering them when the deck is ‘cold’. The variation in size is known as the ‘Betting Spread’. The range of an individual’s betting spread depends on a lot of personal factors such as bank size, comfort level, proficiency in card counting, knowing the rules, etc. However, in order to avoid undue attention from casino staff a bet spread between 1 and 5 units is recommended. This means that you should bet 1 unit for a +1 count, all neutral counts, and all negative counts. A +2 count means 2 units staked, a +3 count means 3 units, a +4 count means 4 units. Anything over +4 signifies a bet of 5 units. Exceeding 5 units is likely to attract unwanted attention from the casino hierarchy. The size of the individual unit depends on your preferences. To stay under the radar you should identify a range between table minimum and maximum. The player must estimate the top end of the count. In other words, how high may the count get in that session? For simplification, we estimate the maximum count at 10. This means that the top end of the player’s personal range is £100, a multiple of £10. Of course, it becomes even more interesting if the table is only approached when the deck is ‘hot’, but this requires a team of card counters. This may sound unreal, but anyone who has seen the film ‘21’ (2008), has watched a good, entertaining movie and also witnessed that a team strategy can be successful. With card counting it is actually possible to gain a decisive advantage over the casino. Many have tried and with great success! Casinos are not stupid. Although card counting is not legally prohibited or punishable, neither under German law, nor in the US, it does not mean that casinos turn a blind eye to card counters. The shoe is never played to exhaustion. After a quarter or a third of cards are played there is a ‘cut off’ and the shoe is reshuffled. The above countermeasures certainly increase the house edge, but card counting players are still able to play winning systems in spite of them. Therefore, many European casinos now use ‘Shuffle Stars’, which are special card shoes. Played cards are immediately mixed back in with the other cards making each round independent of the next, like in roulette. Hence, card counting has become not only difficult but a thing of the past in most casinos today. We hope that this article about blackjack and card counting has enlightened you. Once you think that you are ready it’s time to try, but serious playing is not just going to the next best Internet casino but to the best one. But which one is the best? Check Bestonlinecasino.uk . What distinguishes them from others is that when they say 888 Casino is the top choice for UK players, they actually have the stats to prove it! As you conclude, there isn’t much opportunity for the card counter under today’s casino conditions. Many now use automatic shuffling machines which renders counting effectively worthless. As for other casino games, roulette is a possibility for the so called “advantage player”. There is a technique called visual ballistics in which the player can take into account the inititial conditions (the speed of rotation of the wheel, the type of ball, dealer behaviour, etc) and thereby gain an edge over the casino. There is a fair amount of skill involved in this, as you might imagine, but it can be very profitable. I know several people who do well but you have to “scout” for suitable wheels. Then there is the possibility of exploiting biased wheels. You might think this is a thing of the past but you would be wrong. I know someone in the USA who makes an extremely good living by identifying biased wheels using visual techniques together with basic data analysis, but again you need to invest the time and effort to find the “right” wheels. How do you now when to/not to push your luck. Playing 50 hand I won $200. $200 a day is $50,000 a year. In 12 minutes not bad so I took it. I played out the rest of the 50 hands and had a high of 400 and ended at 50 with 250. Any suggestion on how and when to push your luck and which to stop? Hi Joseph, card games are random distributions that are memoryless. That means that the probabilities of each new game are not influenced by the history of the previous games. Therefore you can only set yourself the target to stop playing when you reached your financial goal of the day because unfortunately, you yourself are not memoryless. Your brain gets tired after a while, and therefore you reduce your own probability to perform on a high level and with each new game you reduce your chances to win.